This is from an illuminated manuscript from France. THE HUNTING BOOK (also known as (THE BOOK OF THE HUNT, or GASTON PHOEBUS' BOOK OF THE HUNT, etc.) was written by Gaston Pheobus, the Count of Foix and Viscount of Bearn. He was born in 1331, wrote this book sometime between May 1387 and his death in 1391. He was well-known for being an excellent huntsman, putting on good parties, and for being an all-round great guy. He wrote this book to explain how to hunt different kinds of animals, how to handle dogs, set up blinds, etc. 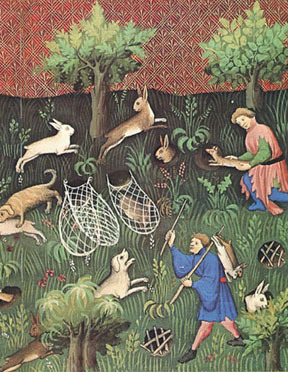 The plate shown here illustrates how to use ferrets to hunt rabbits, and shows the hunters putting muzzled ferrets down rabbit holes, waiting for the rabbits to pop out the other end and into the nets. For a detailed close-up of the ferret, click here. This manuscript is Ms. francais 616, and is located in the Bibliotheque Nationale, Paris. It was reproduced in: THE HUNTING BOOK, by Gaston Phoebus, text by Gabriel Bise (after G.Phoebus), translated by J. Peter Tallon. Regent Books, Hughtext Ltd., 68 Salusbury Road, London, NWE 6NU, pages 72-73. This is from an Italian painting, "Pope Celestinus III Grants Privilege of Independence to the Spedale", by Domenico di Bartolo, 1443. 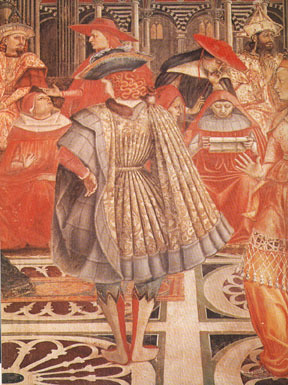 The book I scanned this from said that the young man in the center was supposed to be from Siena, noting that the Sienese were known for their ostentacious manner of dress. This fellow is in the height of fashion, and has his pet ferret (with bells on its red collar) sitting on his shoulder. At least, I think it's supposed to be a ferret. Either that, or it's the strangest-looking dog I've ever seen. It has an extremely bushy tail. Decide for yourself. For a detailed close-up, click here. Alas, I wish I had a color version of this. If anyone knows of a book that has it in color, please let me know. This is a painting in the Louvre, Paris. 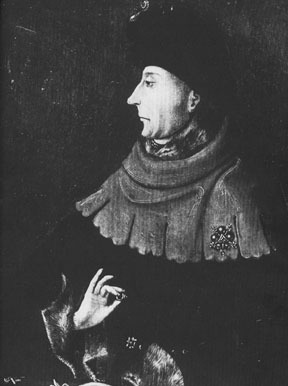 It is of John the Fearless, who was Duke of Burgundy from 1404-1419. You can tell that it's John the Fearless because he has a live stoat around his neck. For a detailed close-up of the ferret, click here. 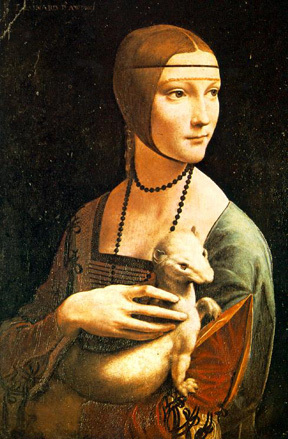 This is a painting by Leonardo da Vinci, his "Lady with Ermine." It is located in the Czartoryski Museum in Cracow, and was painted sometime around 1485-1490. It is believed to be a portrait of Cecilia Gallerani of Milan. The white ermine is meant to be symbolic of chastity. This is the "Ermine Portrait of Queen Elizabeth the First," showing her with her pet ferret. 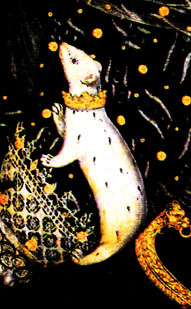 Oddly, the artist has "ennobled" the ferret by giving it ermine spots! This painting is owned by the Marquess of Salisbury, and hangs in the Courtauld Institute of Art. 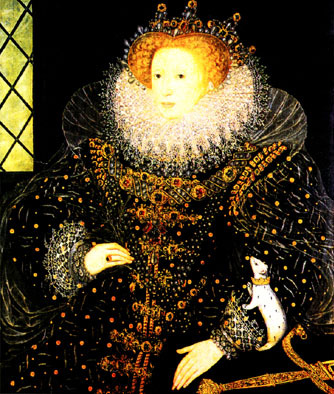 Special thanks to Roberto Mangani of Florence, Italy, for sending me a color copy of the painting (from the cover of "Queen Elizabeth I, a Pitkin Guide"). 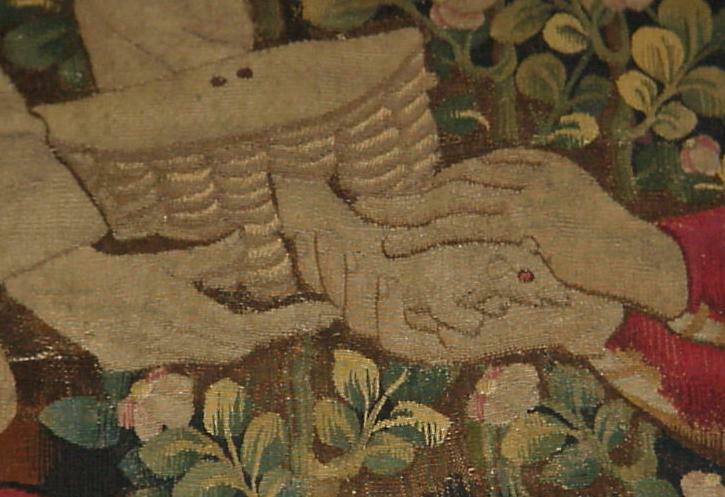 For a detailed close-up of the ferret, click here. 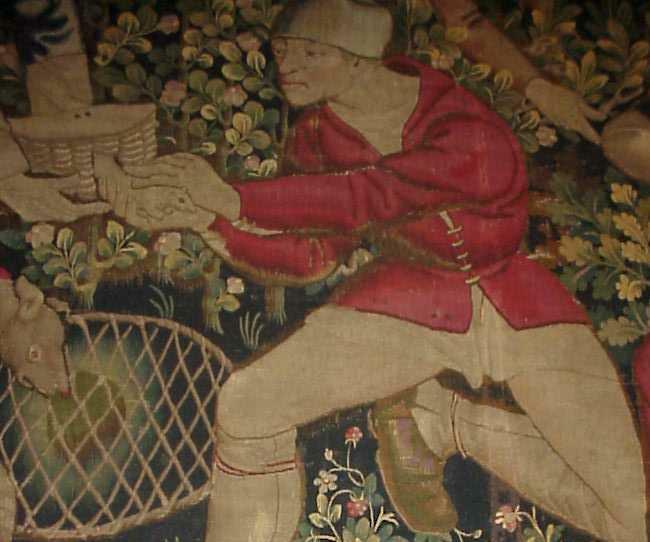 This is from "The Ferreter's Tapestry," a fifteenth-century tapestry from Burgundy, France. It is in the Burrell Collection, Glasgow Museum and Art Galleries. 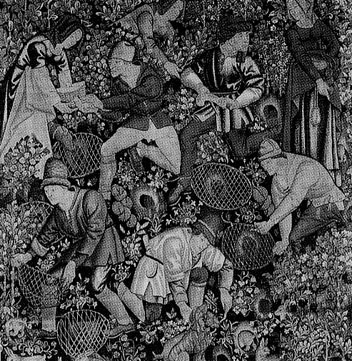 It shows an idealized view of peasants hunting rabbits with purse-nets and ferrets. The woman in the upper left corner is holding a wicker basket, from which a man is removing a white ferret. This was scanned in from James McKay's Complete Guide to Ferrets, Swan Hill Press, Shrewsbury, England, 1995. 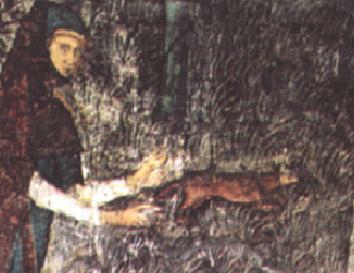 For a full-color detail of the man holding the ferret, click here. For an extreme close-up (in color) of the ferret, click here. Many thanks to Elizabeth Laycock, who sent me the color scans. This isn't art history per se, but rather natural history. It is a picture of the domestic ferret from Conrad Gesner's Historiae Animalium of 1551 (in the British Museum, I believe). Special thanks to Roberto Mangani of Florence, Italy, for sending me this photocopy. Christine Code of Vancouver, Canada, very kindly scanned this in and sent it to me. It is from a postcard that a friend had sent her while traveling in France (and knowing her love of ferrets, he thoughtfully sent the postcard in an envelope!). She said, "My friend wrote: 'Yesterday to the Palace of the Popes at Avignon, where the Holy See was located for much of the early Rennaissance. 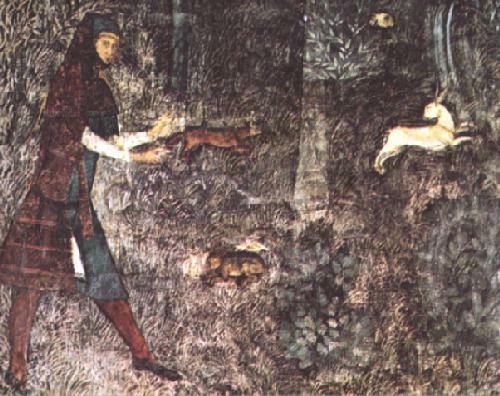 This hunter, releasing a ferret after a rabbit, is part of a giant hunting fresco covering the walls of Pope Clement VI's bedroom." 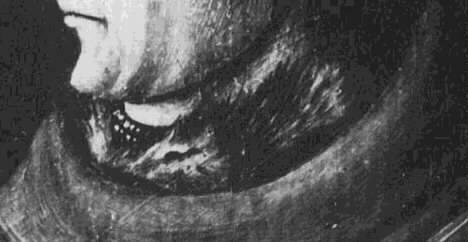 She also said that the postcard said that this painting is "Chambre du Cerf: la chasse au furet. 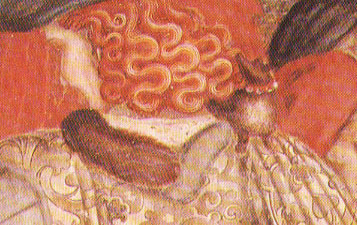 Fresque de Matteo Giovanetti, 1343." For a slightly more close-up view of the ferret, click here. Back to Jay and Joyce's Home Page.